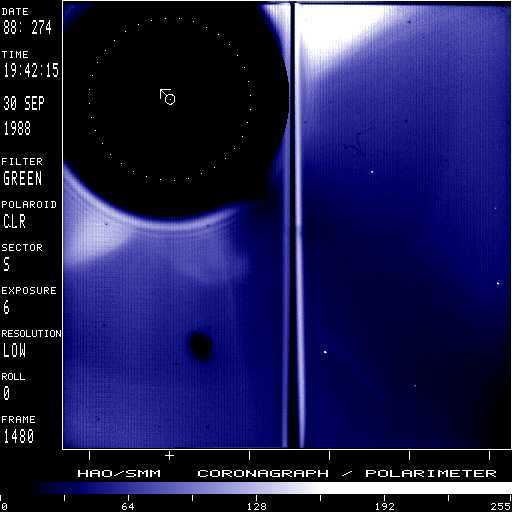 The SMM Coronagraph recorded this image of a faint loop-shaped mass ejection projected over the southern limb of the sun. The dark band extending to the lower right corner of the image is the shadow of the pylon supporting the occulting disc. Solar north is toward the upper left as indicated by the arrow drawn into the occulting disk; the dotted circle marks the solar photosphere. Loop/cavity with fuzzy core superposed on streamer or ray.